When we started, we only had 1.5 inches of an LCD viewfinder, then upgraded to 2-inches after about 2 years. But those are nothing compared to what you are about to see on our next-generation action cameras. 2.33-Inches of Gorgeously Brilliant LCD! The SJ8 cameras have absolutely stunning screens that are never before seen on all earlier SJCAM models. 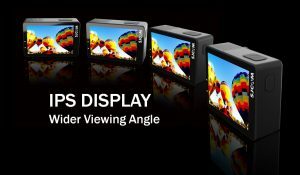 IPS Technology on an Action Camera. 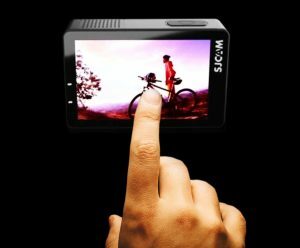 Each SJ8 model proudly boasts a big and glorious 2.33-inch LCD at the back that sports an IPS (In-Plane Switching) display which makes the viewing angle so much wider without losing quality and without compromising color reproduction in every direction you look at it. And not just that, the 720×480 pixels has an astounding 370PPI (Pixels Per Inch) that exceeds the limitation of the human eye! The touchscreen has also been upgraded. Touch response to user navigation is now at par with most major flagship smartphones out in the market today, and the UI responds with buttery-smooth animations that it looks seamless and fluid to your every touch gesture. And did we mention the SJ8 Series is ready for Pre-order today? Well, now you know! Get your SJ8 Series of choice, now available on Pre-Sale on our webshop! CLICK HERE NOW! Before we let you off though, you need to read THIS and make another decision after you choose which model to get: which box to purchase. HINT: The bigger one may actually be more fun.